gr_und’s wintergarten – the entrance glass hall of gr_und – is dedicated to temporary exhibitions and serves the showcase of gr_und’s arts and culture community. For our first season, we’re proud to welcome Berlin / Miami based ar­tist GeoVanna Gonzalez’s installation “FOREVER RIDE OR DIE”. One of the Major Arcana, the Tarot Wheel of For­tune card suggests both change and cycle: we must be ready for our lives to alter, aware that nothing stands still, and that external factors will always be waiting to impact our lives. Invoking ‘Rota Fortunae’ - the goddess Fortuna’s wheel - this piece speaks to the deeply capricious, and sometimes callous, hand of fate. Even if one has left the gods behind, our lives are directed, diverted, and sometimes, derailed by things beyond our control: class, race, social and cultural pri­vilege. The wheel, being one of the six “simple ma­chines” defined by Renaissance scientists, stands for pristine form and democratized technology. 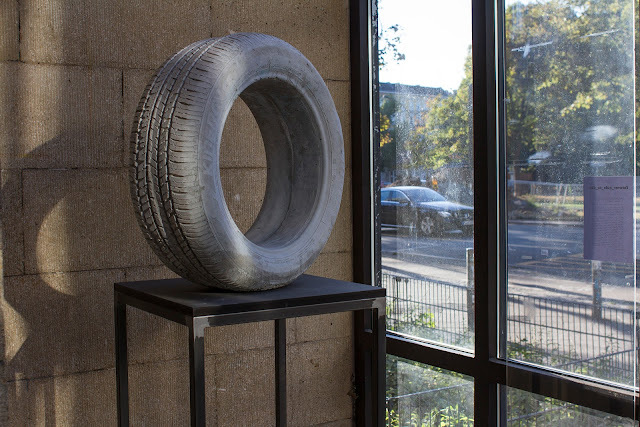 These concrete tires, stripped away from any lush beauty or artificiality, speaking to a more bru­talist reality where movement is leaden with the baggage we carry, the price we pay for the lives we choose and are given, and our respective debts. The deteriorating tires are both symbolic icons and real-world objects. They represent unequal and fortuitous access to comfort, safety, and mobility, thus challenging the humanistic idea of progress.